Life, DLG style: First Food!!! 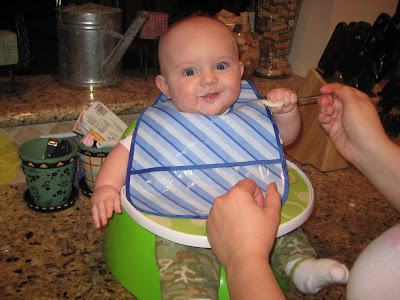 Jon David has moved up from just breast milk to adding in rice cereal three times a day! He likes it and was obviously ready for it. 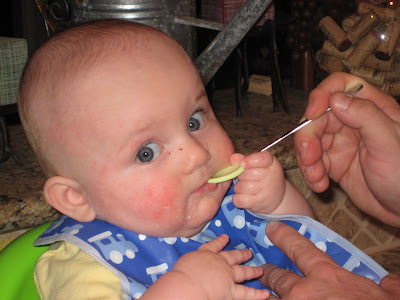 He grabbed the spoon and put it in his mouth. I held back tears as Jon and I fed him his first food. I am so proud of my little man! After Thanksgiving, the adventure is on! I plan to make all of his food at home. With our history of food allergies (milk and wheat) I have to be careful about how Jon David eats. Happy Thanksgiving to all! That's so exciting! We haven't started Whit on solids yet. She takes a formula with rice starch in it. With her cleft, they suggested we wait until 6 mths....but, that's this Saturday! I want to try putting her in a Bumbo that we had for the boys, but it's still in storage. I'm not sure she'll be able to hold her head up enough yet. We'll see. Enjoy Thanksgiving with your sweet little man!